I did a Christmas craft! Yeay! 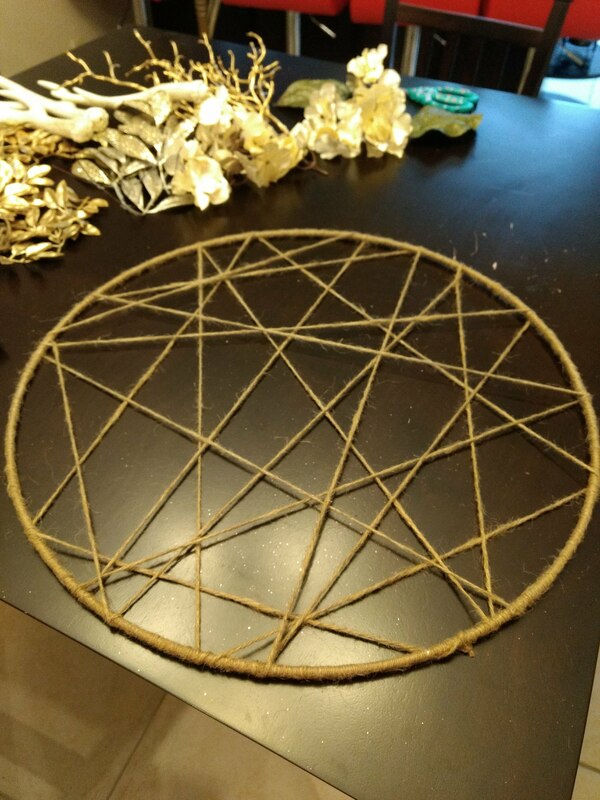 Well, I guess technically it’s a Yule craft, according to the name. 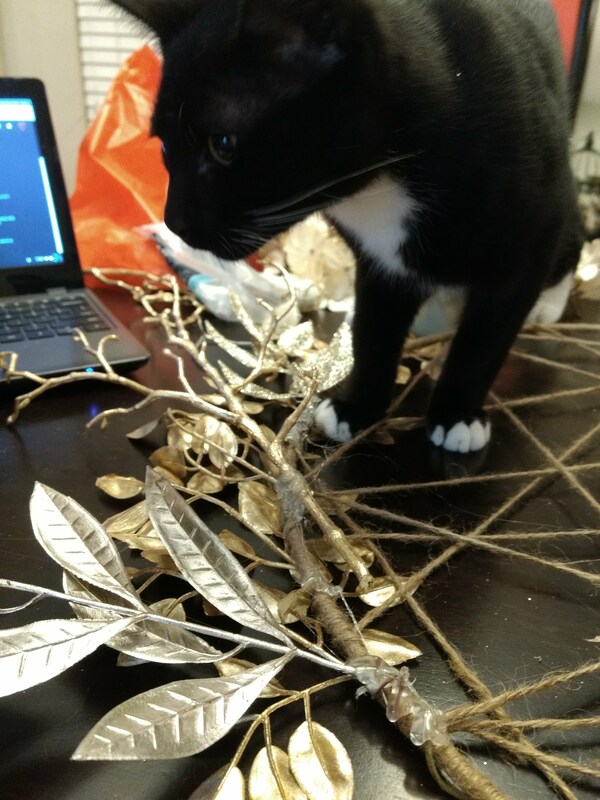 When I showed Husband the finished product, he made a legit “woah” face, told me “That’s freaking cool” and said it reminded him of Hermes which, in many ways, was what I was kind of going for (also Artemis, obviously). Supplies and my scratched up table. It has seen its fair share of crafts. 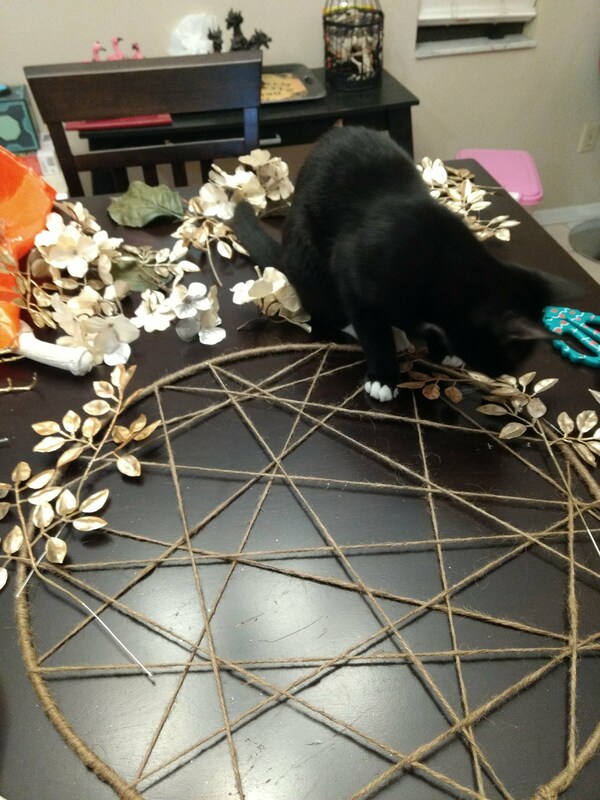 I wanted a wreath, and I figured I could make one, and if I was going to make one, I should go all in and make exactly what I wanted. No greenery here! I took some inspiration from Homemade Ginger for the twine background. I thought it had a distinctly witchy vibe, then tried to take it in a little more wintery direction. 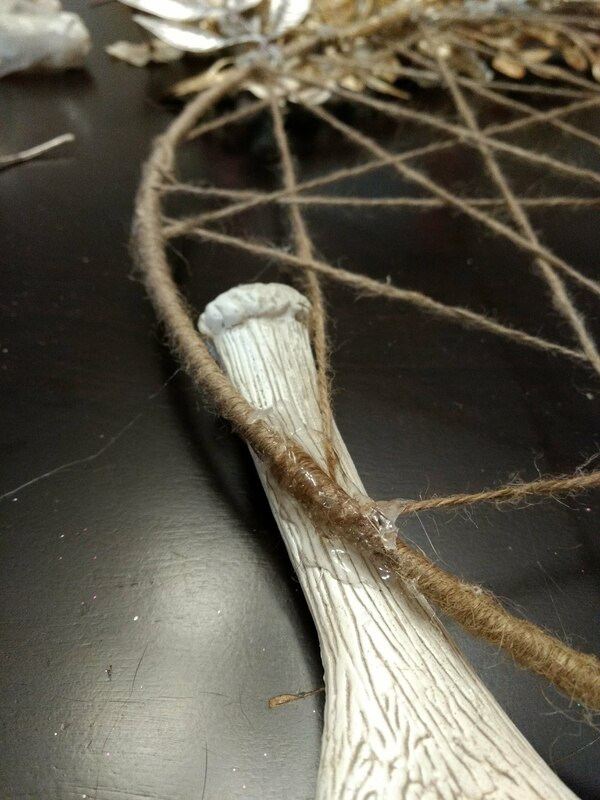 Everything came from Michaels except the twine which just came from my mini craft closet thing. 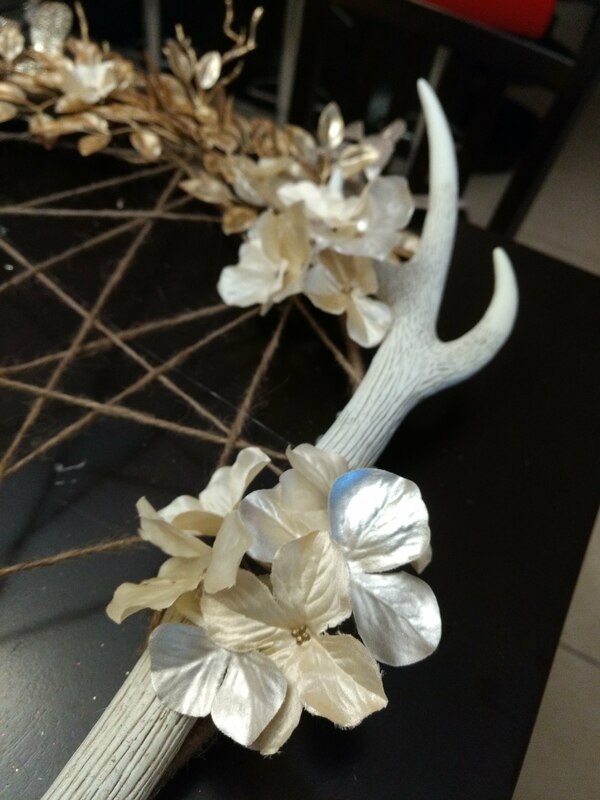 I found sprigs of gold/off-white/glittery things at the store that I thought went well together and were also on sale. They were really big, but I intended to cut everything apart anyway. Twist it around then push it down to tighten. Took forever, but I got some YouTubing in so whatever. Don’t cut the string! Just tie it off in a knot and keep going. Scare your super religious neighbors. I started with a metal ring and wrapped it in the twine–this was both for the aesthetic of the twiney look and to give everything I’d glue to it something to grab onto. 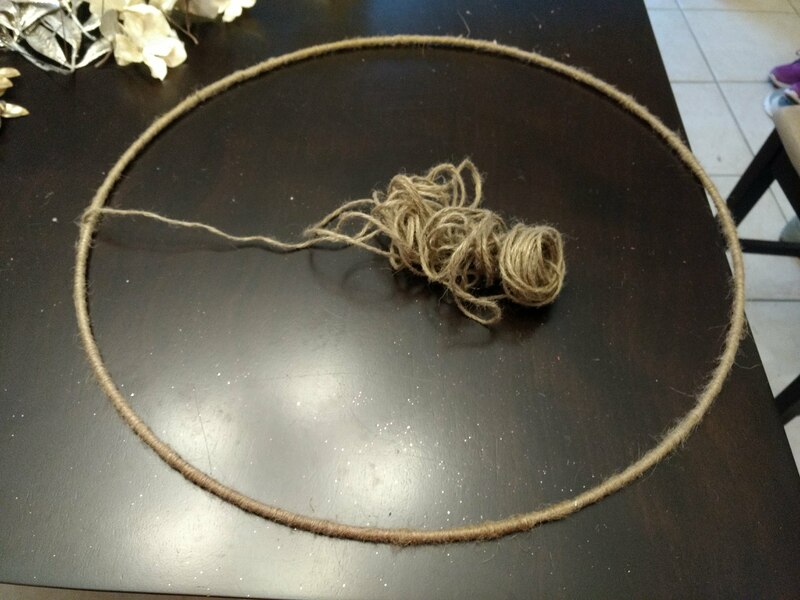 Then I continued with the twine and wrapped it about, criss-crossing the ring. My one regret here was not looping the twine around the ring every time I crossed it. In some places I just when around the ring instead of looping it totally to make it sturdy. I’m afraid the strings might come loose in the future. Ugly from the back, the opposite of me. That got tied off when I felt it was right and then I started laying out the pieces of my flowers where I thought they should go. 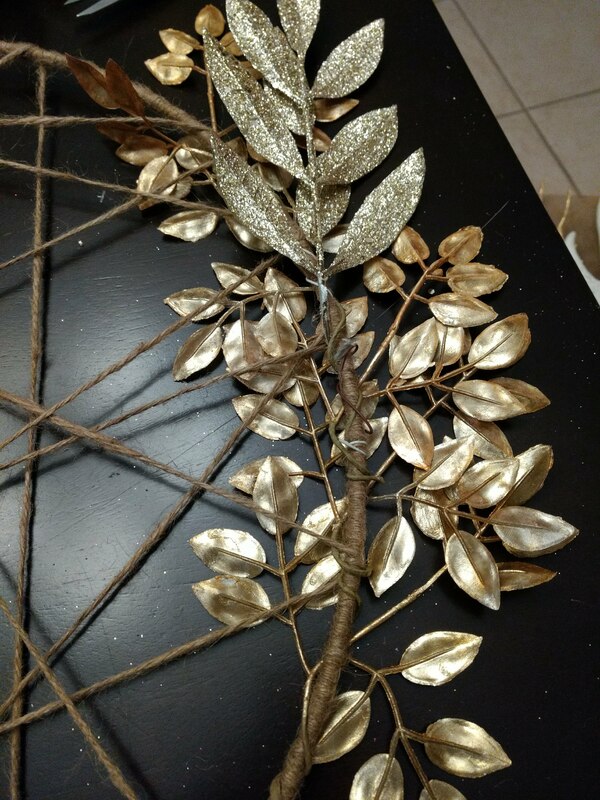 Again, this was all a feeling, but I stuck with the more neutral gold leaves as the base, then added in the glittery leaves in distinct groups since they were visually louder. 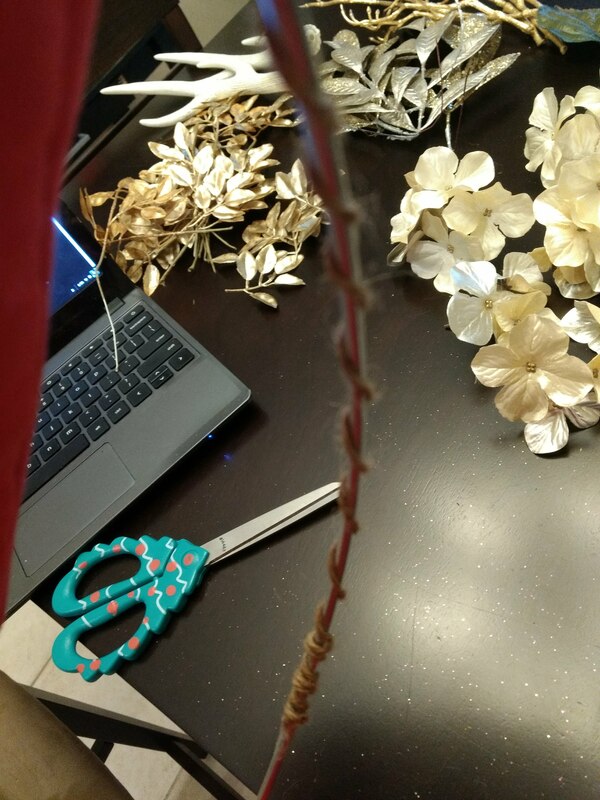 Since they were originally these really tall sprigs, they had wire running through them, so I was able to twist them around the ring until I was ready to start hot gluing which I did from the back at first, then when it dried I added some to the front under the leaves for stability. I burnt myself a lot, so you should feel bad for me. Filled in some holes with random pieces. This is how you fix a broken heart as well. 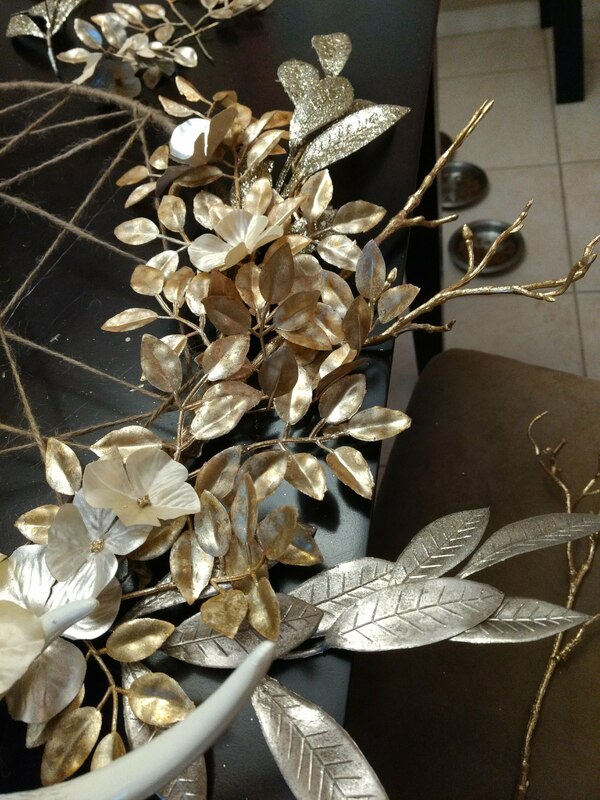 The antlers were planned for the bottom, of course, and the flowers were strewn around to cover up and parts of the metal still visible. Like a lot of artsy fartsy projects, it was mostly by feeling: what looked good to me and would I be willing to continue staring at as time went on? I can stare at this and not get sick of it, I think. I’m just glad I got this done before the new year, honestly. That turned out super pretty!